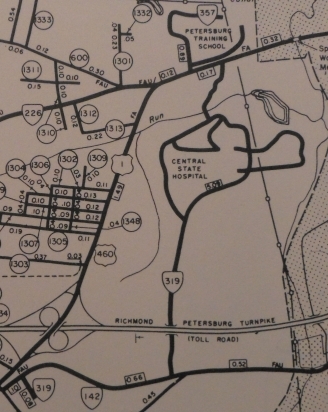 VA 357 #1: The March 1948 (CTB) discusses a proposed primary route from US 60 (now VA 143) Phoebus to the Veterans Administration facility (currently west of I-64). The CTB elected not to do this but the 1957 Route Log assigns VA 357 to the proposed Veterans Facility at Kecoughtan in the city of Hampton. The General Assembly in April 1942 authorized a primary route to serve this purpose. I can find no other CTB reference to this, but by 1965 this went away. 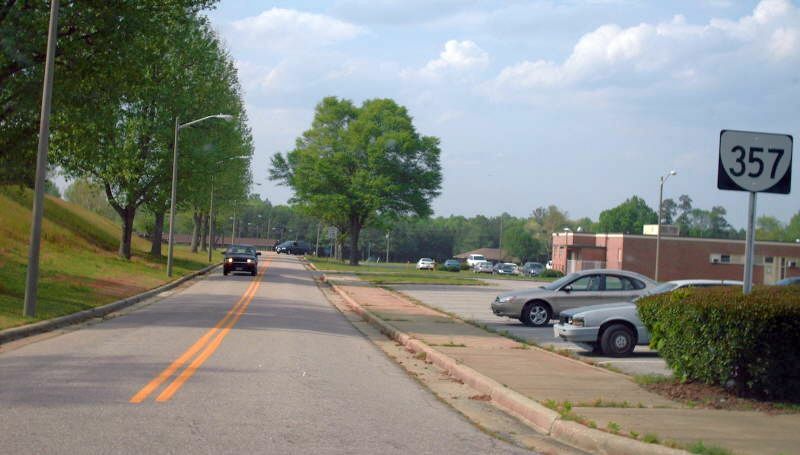 The 1949 Route Log erroneously calls VA 357 the route to the Wilson Rehabilitation Center. 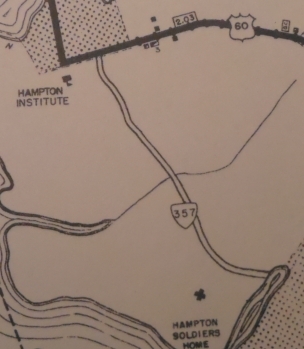 This VA 357 does appear in VDOT County Atlases back to at least 1946. VA 357 #2: Appeared in May 1965 (CTB) off US 1-460 west of Petersburg north to the Southside Virginia Training Center. It was essentially a two-pronged route that surrounded much of the facility but did not connect at its ends. The facility closed in May 2014 and in 2017 was sold to private interests and demolished. This included destroying the roads, physically removing VA 357. VA 357 was decommissioned in March 2019 (CTB). VA 357 was well posted with shields up through destruction, including cutouts to about 2003. For a fascinating story related to the Southside Virginia Training Center that VA 357 was created for, see VA 345.